There are many local points to see in Bangalore like ISKCON temple, Nandi bull, Assembly hall, Banargatta zoo, Vishweshwara Museum, HAL museum etc… But all these are OK. Plan one extra day to stay Bangalore and visit Hogenakkal falls. This can be really a memorable one day picnic from Bangalore. It is 150 KMs from Bangalore. You can hire a taxi for a day and can follow following route to reach the destination. up to Rs. 600-800 for 3 hours ride. During the starting of coracle ride, the person took us in his coracle under waterfalls and we were all wet by the falling water and it was a nice experience. There are the round coracles, which you may have seen in the film ROJA, which Madhu uses to sing a song. You have to carry plastic bags to protect your cameras, purse and other valuables. Small children jumps into the deep river from 25-30 feet height to take just 5 rupees from you. You please bring your food with you. Small lodges are available here. Visit this place any time during the year. 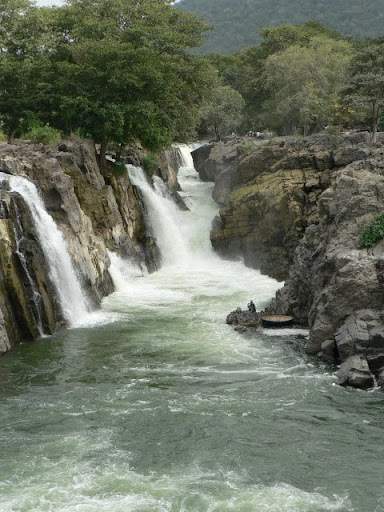 But in monsoon you may not enjoy the boat ride in deep river but can enjoy classic water fall.